Delta and Bank of America dropped their sponsorship of the play; Delta said it "crossed the line"
The Public Theater is refusing to back down after backlash over its production of "Julius Caesar" that portrays a Donald Trump-like dictator in a business suit with a long tie who gets knifed to death onstage. A performance of the classic Shakespeare play went on as planned in Central Park Monday night despite uproar over the stabbing of the Trump look-alike. Delta Air Lines and Bank of America have pulled their sponsorship of the Public's version of the play, but in a statement Monday the theater said it stands behind the production. It noted its staging has "provoked heated discussion" but "such discussion is exactly the goal of our civically-engaged theater; this discourse is the basis of a healthy democracy." Other defenders included Scott Stringer, the New York City comptroller, who wrote letters to the heads of Delta and Bank of America, arguing that dropping their support "sends the wrong message." He writes: "Art matters. The First Amendment matters. Expression matters." He enclosed copies of the play with the letters. "I hope you enjoy it - it is a classic, in any age," he wrote. The artistic director of the play, Oskar Eustis, defended it during remarks before Monday evening's show. "Like drama, democracy depends on the conflict of different points of view," Eustis said. "Nobody owns the truth, we all own the culture." Alec Baldwin, known for his biting portrayal of Trump on "Saturday Night Live," was spotted at Monday's performance of "Caesar." This modern-day Caesar's violent death at the hands of conspirators comes not long after comedian Kathy Griffin was widely condemned for posing for a photograph in which she gripped a bloodied rendering of Trump's head. Though the Public's version of William Shakespeare's classic play is unchanged from its 400-year-old original, the production portrays Caesar with a gold bathtub and a pouty Slavic wife. Trump's name is never mentioned, but backlash was swift. On Sunday, Donald Trump Jr. retweeted a Fox News story about the play and wrote, "I wonder how much of this 'art' is funded by taxpayers? Serious question, when does 'art' become political speech & does that change things?" Delta responded by saying "artistic and creative direction crossed the line on the standards of good taste." 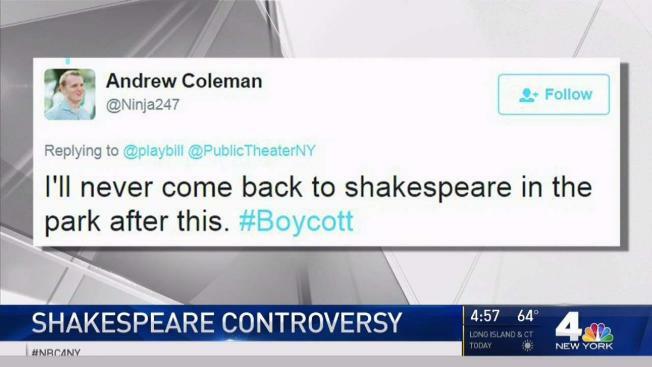 Bank of America said the Public chose to present the play "to provoke and offend" without the bank's knowledge: "Had this intention been made known to us, we would have decided not to sponsor it." ...The Public Theater effective immediately. "Julius Caesar" ends its run Sunday. The comedy "A Midsummer Night's Dream" begins in the park on July 11. The National Endowment for the Arts, which Trump, a Republican, once proposed eliminating, said that while the Public's Shakespeare programing has received its grants in the past none was awarded for "Julius Caesar" or for funds supporting the New York State Council on the Arts' grant for the Public. Theater lovers were quick to point out that a national tour of "Julius Caesar" in 2012 by The Acting Company featured a Caesar played by a black actor in a modern business suit who had a resemblance to then-President Barack Obama, a Democrat. Sponsors of the Guthrie Theater, including Delta, apparently had no objections when that show landed in Minneapolis. It's had Trump in its sights before. It's the institution that birthed the megahit "Hamilton," whose cast members last year implored Vice President-elect Mike Pence to support diversity, and where Meryl Streep donned self-tanner and a fat suit last summer to impersonate Trump at a gala fundraiser. Laurence Maslon, an administrator and arts professor at New York University's Tisch School of the Arts, said it was disingenuous for large corporations that have backed the Public for years and enjoyed co-opting its downtown cool vibe to sound alarmed now. "You've got to know what you're getting into," he said, adding that the Public has "50 years of the most provocative, politically engaged work." He backed the "Julius Caesar" director, Oskar Eustis, saying he's "nothing if not brave." The Public produced "Embedded," Tim Robbins' heavy-handed 2003 riff on the events leading to the war in Iraq that had actors portraying hawkish presidential advisers wearing masks with grotesque facial expressions. In 2006, Eustis dedicated the summer season in Central Park to three works that focused on foreign affairs - "Stuff Happens," in which David Hare looked at the debates in Washington in the lead-up to the Iraq war, a militaristic production of "Macbeth" set in the early 20th century and a "Mother Courage" with a new translation by Tony Kushner that had references to tax exemptions for the rich. Maslon said he thinks any loss of funding the Public experiences from corporate defectors will be compensated for by donations from liberal grass-roots groups and people worried about the apparent threat to artistic freedom. "I can imagine any sense that this political regime is imposing a kind of censorship and the free market can help correct it will probably be good for the Public," he said. The Public isn't the only theater project trying to address the advent of Trump. On Broadway, Jon Jon Briones, who plays the sleazy Engineer in a revival of "Miss Saigon," makes a sarcastic reference to the Trump campaign slogan, "Make America Great Again." The recent off-Broadway play "Building the Wall," by playwright Robert Schenkkan, imagined the country under Trump's campaign promise to detain immigrants living in the country illegally. 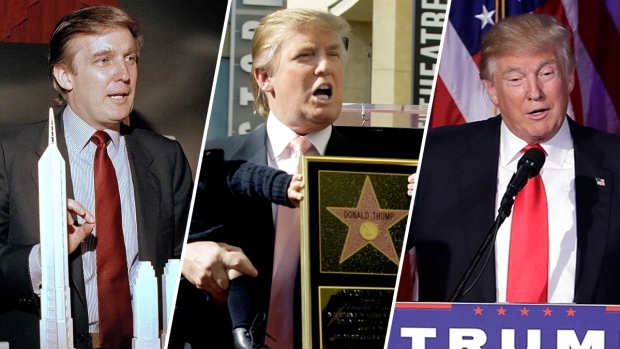 And filmmaker and activist Michael Moore is bringing a one-man show taking on Trump to Broadway this summer.